Urban Experience (UX) is like nothing you’ve ever done before. For two to five days, you’ll see for yourself what it’s really like in the heart of Skid Row. This is a great way for a business, church, or other group to grow together. You’ll stay at Union Rescue Mission on our rooftop. 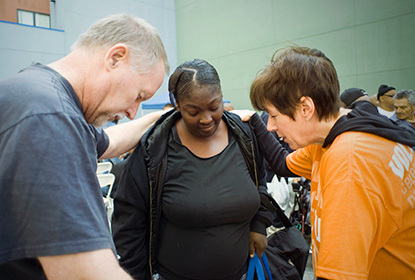 Serve men, women, and children experiencing homelessness. Get an inside look at one of the largest rescue missions in the country. UX is an experience you won’t forget! Serve. UX volunteers have prepped and served meals. Worked on Mission cleaning and painting projects. Assisted in administrative offices. Learn. While you’re working, you’ll meet men and women with great urban ministry experience. Many of them have graduated from or are currently in a URM program. Reflect. Your schedule will include group time to talk about all that you’re learning and experiencing. We can accommodate up to 15 volunteers per group and your stay includes meals. We will provide an itinerary for your time at the Urban Experience. But we encourage groups to personalize their experience so feel free to share your ideas and suggestions. For availability and more information, please email volunteer@urm.org and include the words URBAN EXPERIENCE in the subject line.